If we were having coffee today, I’d be brimming with news. I know it’s starting to sound like a broken record but most of it is about the cookbook. It is what’s happening this week. At long last the book has finally completed it’s initial rollout. For almost a month it has been available on Smashwords, but at long last it is on Barnes & Noble, iBooks, and Kobo. There is a process on Smashwords that verifies the format … they came back with some formatting tweaks I needed to make before it could roll out to everything else. Now that it has been tweaked, the rollout is complete. All the links to the various venues can be found on my web page. The last piece of the puzzle, Amazon, is in place, but there are a few kinks. For one, although it is free on Smashwords, iBooks, Barnes & Noble, and Kobo, I can’t offer it for free on Amazon, at least initially. So it sort of a Firesign Theatre thing … “Free, Only a Dollar.” Or ninety-nine cents to be more precise. It should be up on Amazon for a few days. In theory, once Amazon notices it is free in other venues, they will price match. We’ll see. If you want, I think you can “report” a lower price, like on Barnes and Noble, and that should help spur them to action. Anyway, that is what’s going on. In other news, as reported last week, the cover of my second novel, A Curse That Bites Deep, won a contest last week, AuthorShout.com‘s Cover-Wars. My stint as “book of the week” has given me a slight boost in web page views. Today is the end … it’s been a nice run. Have a happy Easter Weekend. If we were having coffee today it would be all about the contest. “What contest?” The weekly Cover Wars contest. I don’t know why, but I chose not to proselytize here last week when the contest was starting. I don’t know why. I guess I thought I had a lot of followers from here already and I posted about it outside of weekendcoffeeshare, but I just didn’t feel right about talking “vote for me” here. Ah, but the week is over and my cover won! One of the perks of winning: A CURSE THAT BITES DEEP is the book of the week! A little background: This competition is hosted by a book marketing site called Author Shout. They offer a lot of author and book services and when you purchase marketing from them, they promote the heck out of your book on social media. Every week, they have a free “Cover Wars” competition … they put up a batch (usually 10-15) cover photos and people vote for their favorite. 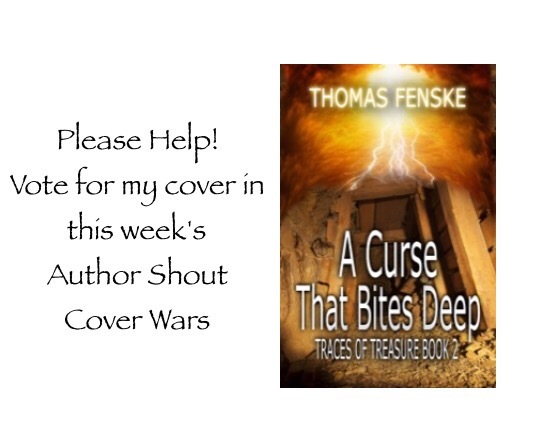 Sure, I think my novel A Curse That Bites Deep has an awesome cover, but I also know, this is WAR. I enlisted the aid of my FaceBook friends and tweeted and posted on several mailing list groups I belong to. The key to this contest is repeat votes … people can vote once every 24 hours. I was able to gently pester my friends enough every day for seven days to get the win. I’m always amazed at covers that get less than seven votes. I mean, even if I was totally not going to win, I’d make sure I got at least seven votes, right? So please excuse me for tooting my own horn a little this morning. After all, it IS an awesome cover for an awesome book. 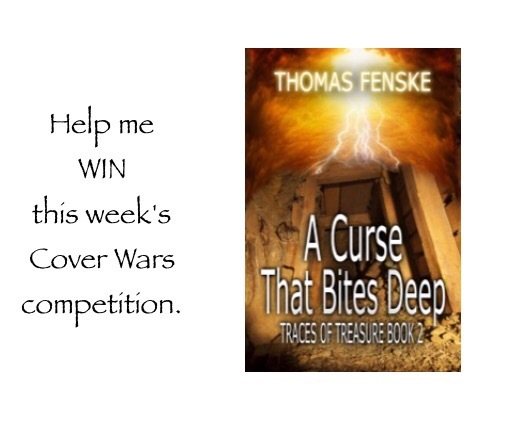 The Cover Wars competition I mentioned the other day is still running. Please take a moment and vote for my book, A CURSE THAT BITES DEEP. You can vote one time every day through Saurday Night. If we were having coffee today I guess we’d both mention April Fool’s Day. It always seems so appropriate to “do” something on April Fools Day. The fact of the matter is, I joke all the time so I’m a bit jaded by April Fools. It’s a bit like a heavy drinker making a big deal over New Year’s Eve or St. Patrick’s Day as a drinking day. I mean, for them, every day is a big drinking day so why seize on those events, right? So, anyway, I’m just not in the mood this year. Maybe it’s my weeklong backache, or the reorganization at work, or the growing grass and weeds in the yard which brings me back to, well, back to my backache. Sigh. With my back, I know I just need to give it some time. It always manages to work itself out. It twinged up on Friday a week ago and was feeling better last Sunday so I did a little bit of yard work but paid the price. If I’d let it go last week, I’d probably be ready to go out and do battle now. As it is, I’ll probably need to wait until next weekend. As far as the reorganization goes, they are a way of life at work. Somebody is always reorganizing something. I’ve worked at the same place for seventeen years and I have completely lost count of the reorganizations. The other day I tried to remember all of my bosses names and I drew a blank on a couple of them. It is simply a way of life in big corporations. I have two theories about why that is, and I think they are related. One: some form of movement gives the outward impression of progress. In fact, it is really just moving the many pieces around. Oh, little things change, sure, but basically, it ends up being the same work. Nothing ultimately changes. Two: by its nature, this form of change tends to cause anxiety and discontent. This leads to what I call passive layoffs. These occur if people are already dissatisfied with the company and the unnecessary changes might just spur them to quit and move on. This is a win-win for the company because formal layoffs are very expensive. If they can up the irritation factor just a little, they save a ton of money. Silly April Fools notion? Think about it. Think about times you’ve worked at a job and some inane policy has come up that made you seriously consider moving on. As far as I know, I made this term up but deep in my heart, I know it is a real thing. No joke. It’s a subtle form of managerial influence. It is akin to the theory that fast food eateries have color schemes designed to influence you to eat fast and get the heck out of there by using a subconscious influence to increase their customer turnover and make more money. We’ll have to see how all that plays out for me. I’m pretty used to these changes, but we’ll have to see. It’s a big unknown. Yesterday I had one manager, today I have another. In other April Fool’s Weekend news … there is an important sports milestone this weekend. No, I’m not talking about Basketball. Never have been a big fan, although sometimes I’ll watch the last two minutes. No, I’m talking about a real sport: BASEBALL SEASON STARTS TOMORROW. Note: there is no “last two minutes” in baseball. Downloads of the new cookbook have slowed down. Please check it out. It’s fun, it’s got some good recipes, and it’s free. It’s also a good introduction to the world of my two novels. As a reviewer put it this week: “This little cookbook makes the novels seem almost like reading about friends” … ebook only right now, but like I said, it’s free and there are versions for virtually any device. So, even though I haven’t joked at all … that is so out of character for me, I think I can say, April Fools.